We wanted to spreed a bit of cheer the season that’s in it. 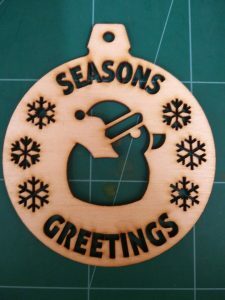 We decided to make some baubles. The fabulous Louise Nolan did up lovely design. We cut them all on our laser cutter and then with the help of all the craters, we have them ready to send to friends of Tog. If you would like to make your own our designed is available here or check out more photo of the fun we had making them in our gallery. This was written by tdr. Posted on Thursday, December 15, 2016, at 10:10 pm. Filed under Laser. Bookmark the permalink. Follow comments here with the RSS feed. Post a comment or leave a trackback.